The BEACON® Advanced Metering Analytics (AMA) managed solution from Badger Meter brings a new level of utility-optimizing information to light. The BEACON AMA managed solution combines the power of the intuitive BEACON AMA software suite with proven ORION® Cellular/Fixed Network technology to provide utility management with greater visibility and control. 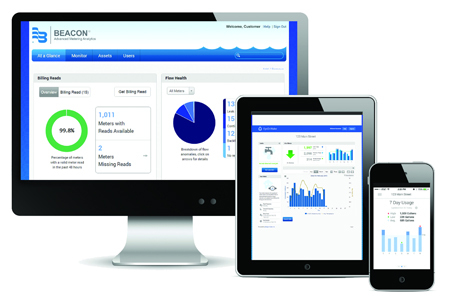 Configured by Badger Meter for each utility, this managed solution provides built-in infrastructure management services and a system design that keeps you in step with technology advancements, allowing you to focus on what you do best—managing your water utility. Consumer engagement tools will help enhance customer service, increase satisfaction and reduce costs. The BEACON AMA managed solution delivers a simple yet powerful end-to-end solution. Increased Visibility through Analytics: The BEACON AMA managed solution provides proactive intelligence for optimal utility management – faster leak detection, revenue management, water conservation clarity and easier data collection for compliance reporting. Enhanced Customer Service: Powerful data tools provide greater water usage visibility to you and your end water customers. Advanced user profile and anomaly trending, combined with a consumer engagement website and smart phone/tablet apps, allow you and your customers to gain a greater understanding of consumption patterns to quickly resolve or prevent customer service related issues. Focus on Water Management: The BEACON AMA managed solution was built to minimize your deployment and system maintenance. We provide the hosted software platform, system maintenance and software support that allows you to focus on doing what you do best—delivering high quality water to your customers. Future-Proof Technology: Our flexible system design keeps you in step with technology advancements. With a BEACON AMA managed solution, you receive the cloud-based BEACON AMA software suite with regular updates, ORION® Cellular and/or Fixed Network endpoints, and long-term support and maintenance.